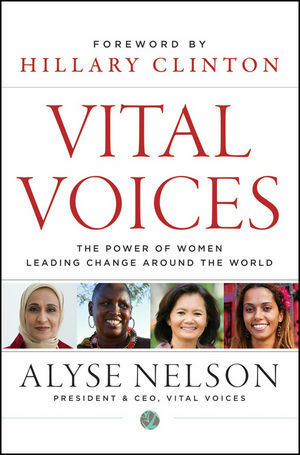 In Vital Voices, CEO Alyse Nelson shares the stories of remarkable, world-changing women, as well as the story of how Vital Voices was founded, crossing lines that typically divide. For 15 years, Vital Voices has brought together women who want to enable others to become change agents in their governments, advocates for social justice, and supporters of democracy. They equip women with management and business development skills to expand their enterprises and create jobs in their communities. Their voices, stories, and hard-earned lessons—shared here for the first time—are deeply authentic and truly vital. Through the firsthand accounts of trail-blazing leaders, Vital Voices introduces unforgettable, inspiring women who are shaping our world. Alyse Nelson is president and chief executive officer of Vital Voices Global Partnership. A co-founder of Vital Voices, Alyse has worked with women leaders since 1996 to develop mentoring and training programs in over 140 countries and has interviewed more than 200 international leaders. She completed her graduate degree work at Fletcher School of Law and Diplomacy at Tufts University, and she lives in Washington, D.C.
Vital Voices Global Partnership, founded by Hillary Rodham Clinton, is the leading nongovernmental organization that identifies, trains, and invests in emerging women leaders, enabling them to create a better world for us all. Learn more at www.vitalvoices.org.